If you haven’t tried quinoa, you should! 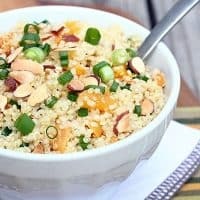 This is one of my favorite quinoa salads. Although quinoa isn’t a grain, you can use it to replace grains in many dishes. It’s actually the seed of the Goosefoot plant and is widely cultivated and used in South America. The great thing about quinoa is that, unlike most grains, it’s full of protein. So it’s also a great vegetarian option. Besides making great salad, quinoa is also great as a side dish, as well as in soups. This salad is great for taking to lunch at the office. I like to keep the toasted almonds separate and add them just before serving, so they stay nice and crunchy. For an even heartier version, try adding some cooked, shredded chicken. Bring water to a boil and add quinoa. Cook for 15-20 minutes over medium low heat until water is evaporated and quinoa is tender. 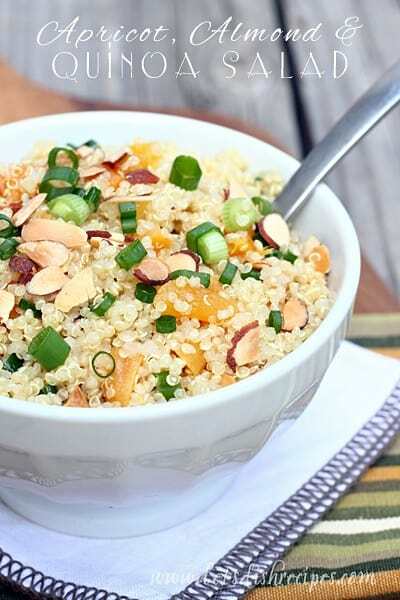 Allow quinoa to cool, then combine with apricots, almonds and chives. Combine olive oil, vinegar, mustard and sugar in a small bowl. Stir dressing mixture into quinoa mixture. Chill at least 30 minutes before serving. Who Dished It Up First: Adapted from Mother Rimmy’s Cooking Light Done Right. Yum, I’ve been looking for a fruity quinoa salad to try. looks great! This sounds delicious… I bet it would be a hit as a side at a summer BBQ! I added dried cranberries to this. It was delicious. Love quinoa.